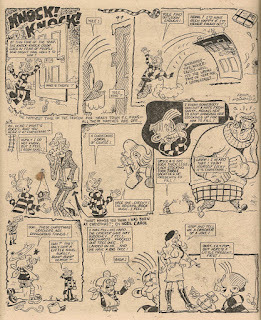 Frank McDiarmid's reference to his expected earnings (whatever they paid him, it wasn't enough!) and Cheeky's allusion to Uncle Hamish's calendar-related transaction a year earlier. 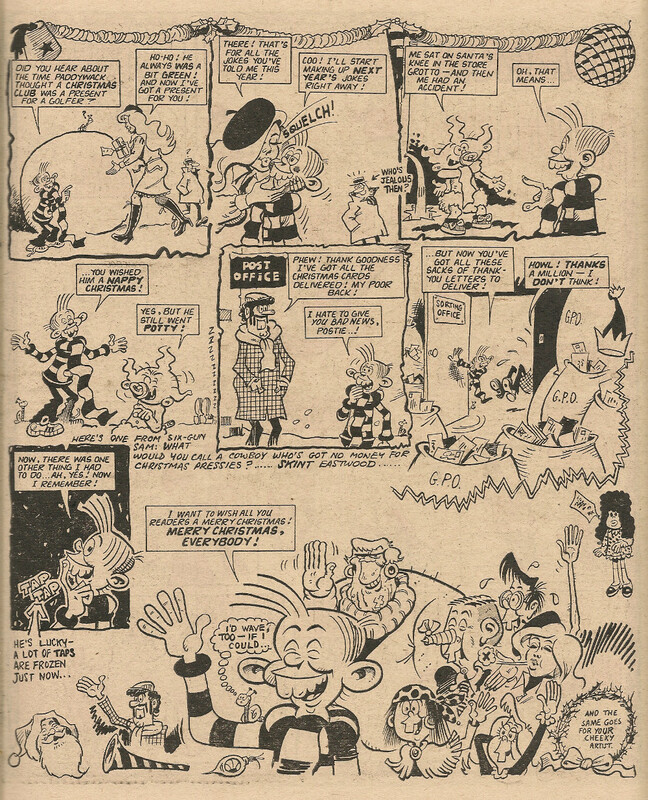 The note about Cheeky's direction of gaze in the first panel of May, and his grin of sheer delight in the final panel of the same month (we all know he doesn't really mean it). 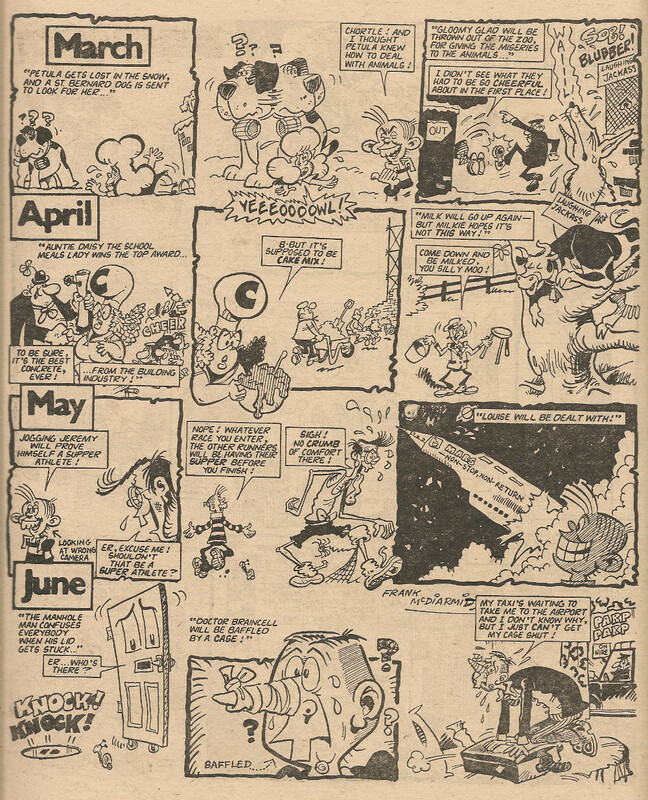 The first panel of June! In August, Walter Wurx being tested by a scene of liquid mayhem that would tax the most resolute of urinary tracts. 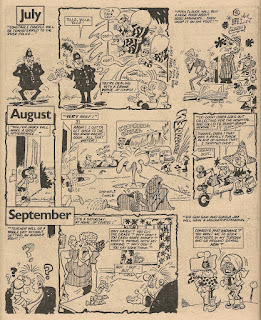 Cheeky's September speculation on Teacher's domestic dolor (no doubt based on the troubling scenes he witnessed in the 'Teacher's breakdown' issue). October's depiction of a swimsuited Lily Pop. 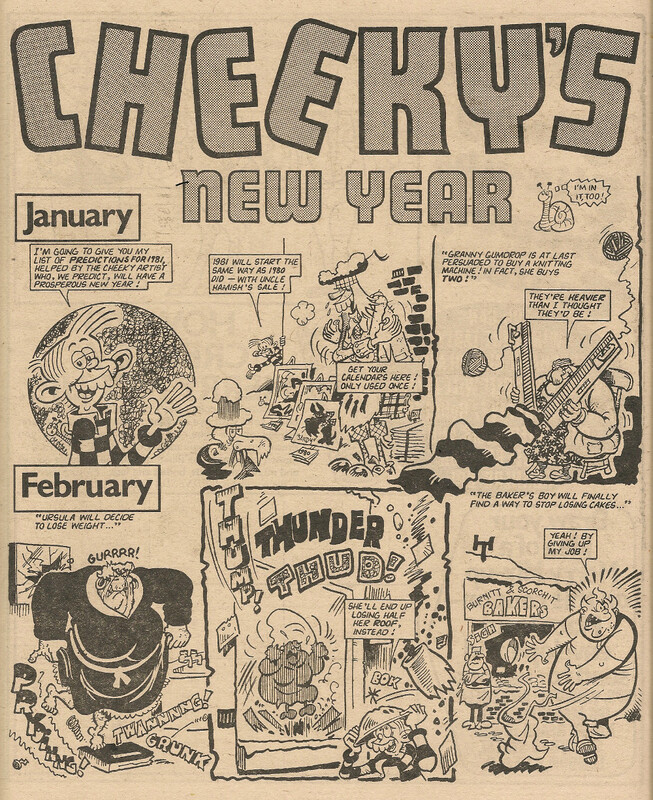 Baby Burpo's brother making his debut in November (although in January 1981 this was clearly among the most speculative of Cheeky's predictions). 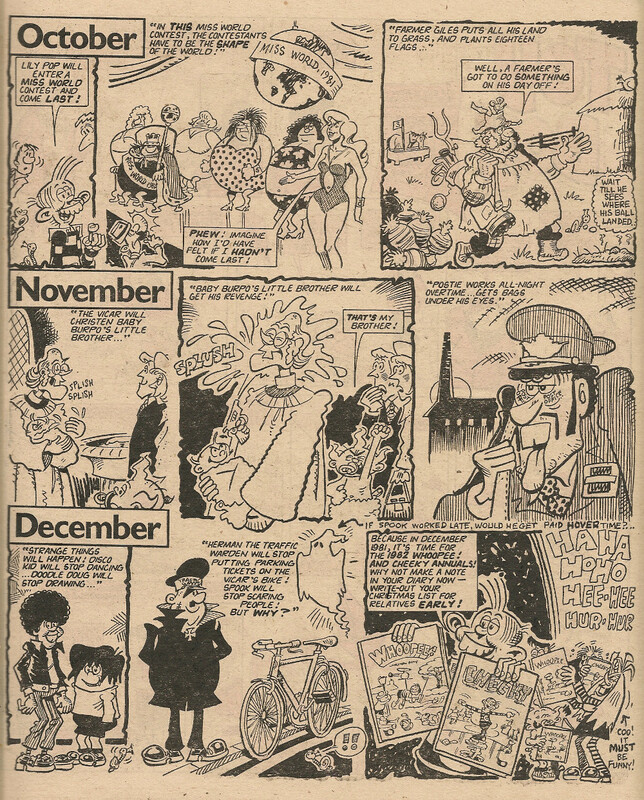 Cheeky's entirely accurate December preview of the designs that would grace the covers of the 1982 Whoopee Annual and its Cheeky companion, set to hit the shops some months hence (that year's Whoopee! 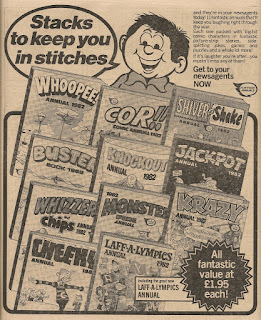 and Cheeky annuals were first advertised in Whoopee! 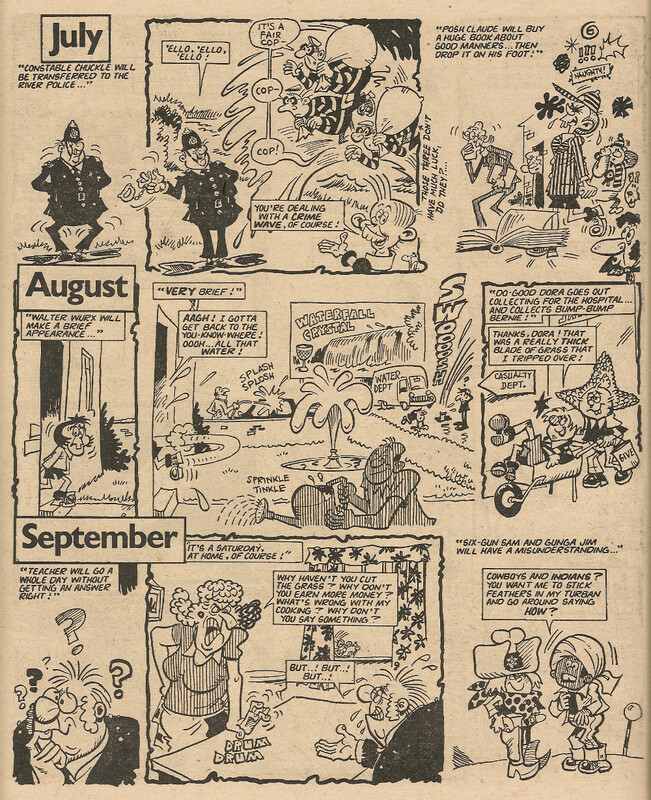 in the edition dated 29 August 1981). 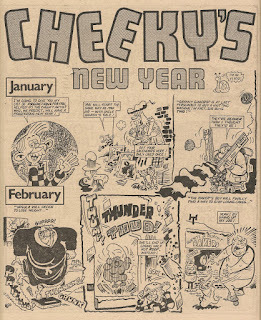 Nice to see that the toothy funster predicted a cheerier end of the year for Teacher and Glad. All the best for 2017, pals! 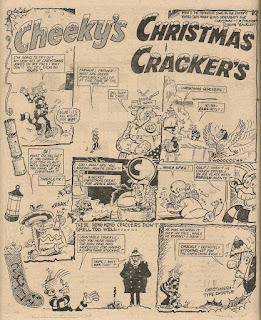 Bruce is looking back at Cheeky's yuletide doings from 1979 (among other festive goodies). 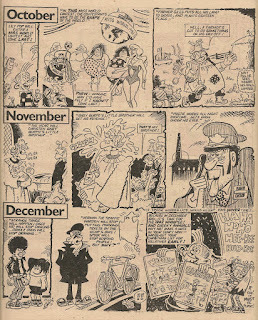 You can see the toothy funster's seasonal silliness from the following year here. 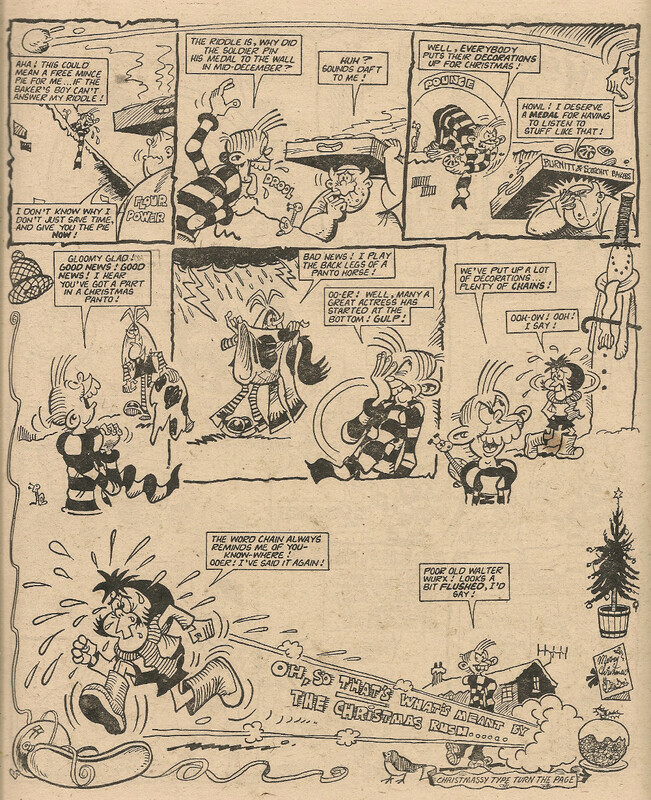 To get you into the seasonal spirit here's four pages of festive fun starring Cheeky, from the first Christmas issue of Whoopee! 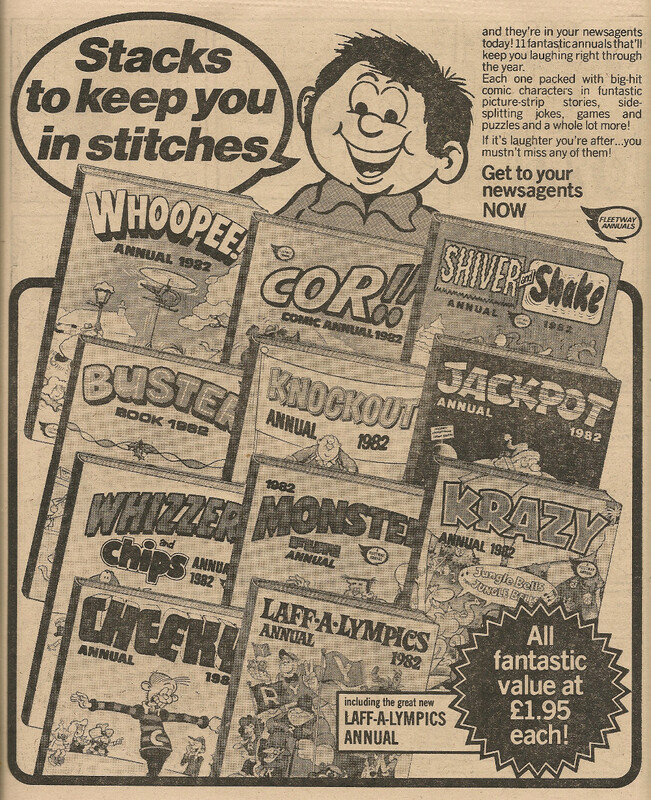 to hit the shops after it absorbed an ailing Cheeky Weekly in February 1980. 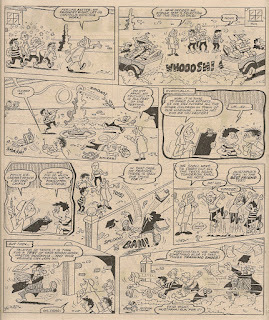 Over the weeks there were many anonymous stooges who shared a joke with Cheeky and were never seen again. 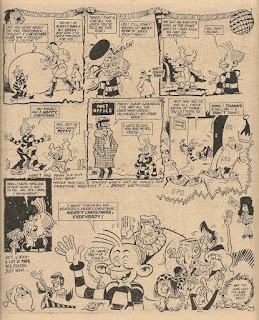 Certain of these ephemeral members of the Cheeky cast, however, were introduced in such a way that one expected them to become regular characters. 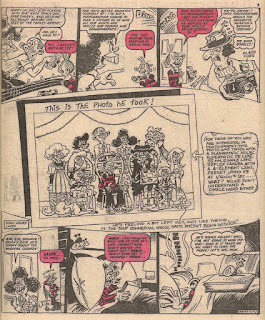 This series of posts examines those 'one-off' appearances. 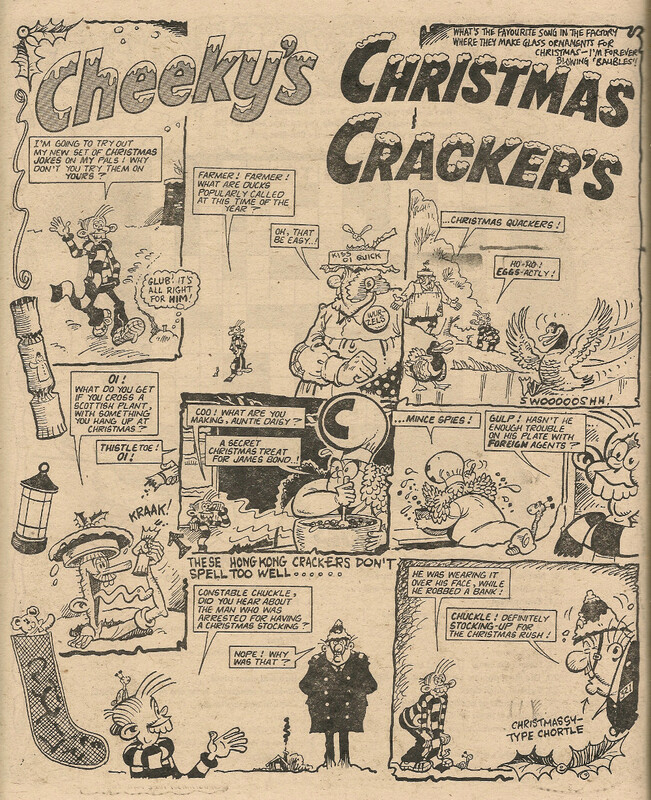 Cheeky's mum and dad were regularly featured from the debut issue, but until the first Christmas edition (dated 31 December 1977), readers hadn't witnessed any other member of the Cheeky clan. It's no wonder our grinning hero has such a magnificent mouthful of dinner-manglers when both sides of his family are so chromosomally-disposed to having titanic chompers. 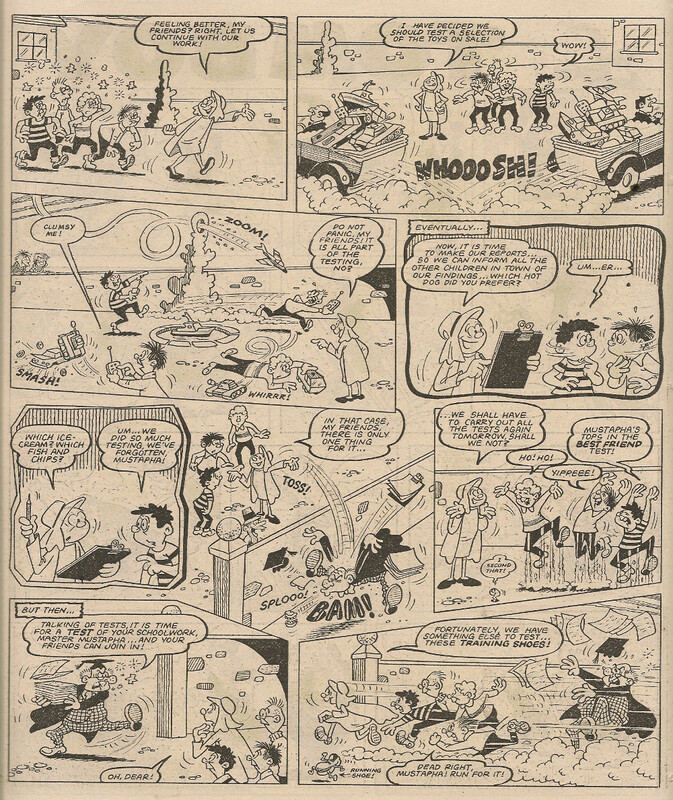 In Flash Harry's photo above we can see what looks like Cheeky's Granny and Grandad, plus sundry unspecified relatives and a canine with remarkably familiar teeth. None of these characters appeared again. 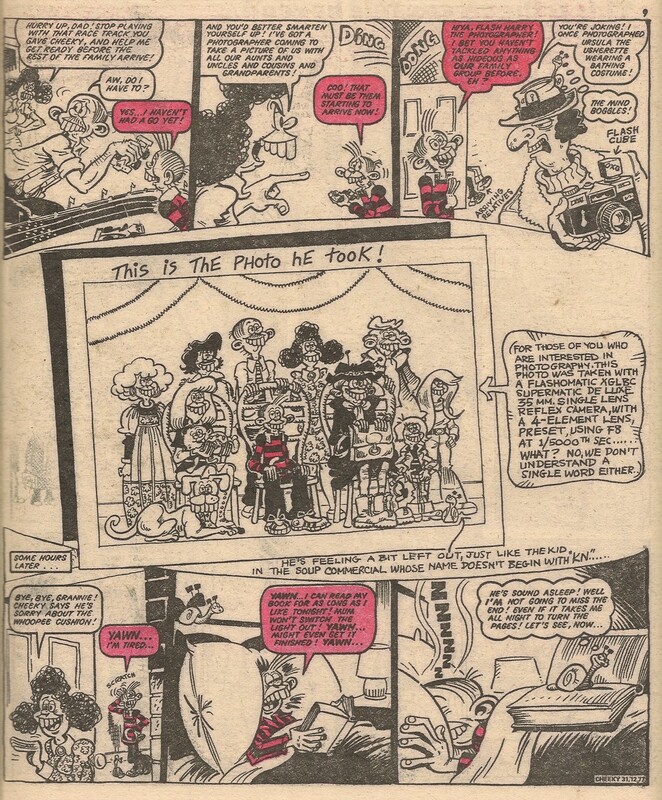 However, it appears Cheeky had an uncle and aunt who didn't make it into the above family portrait, but did appear in the 11 February 1978 issue. Having served their purpose as part of Cheeky's plot to view his favourite TV programme, Auntie and (presumaby) Uncle's services were no longer required and they never returned. 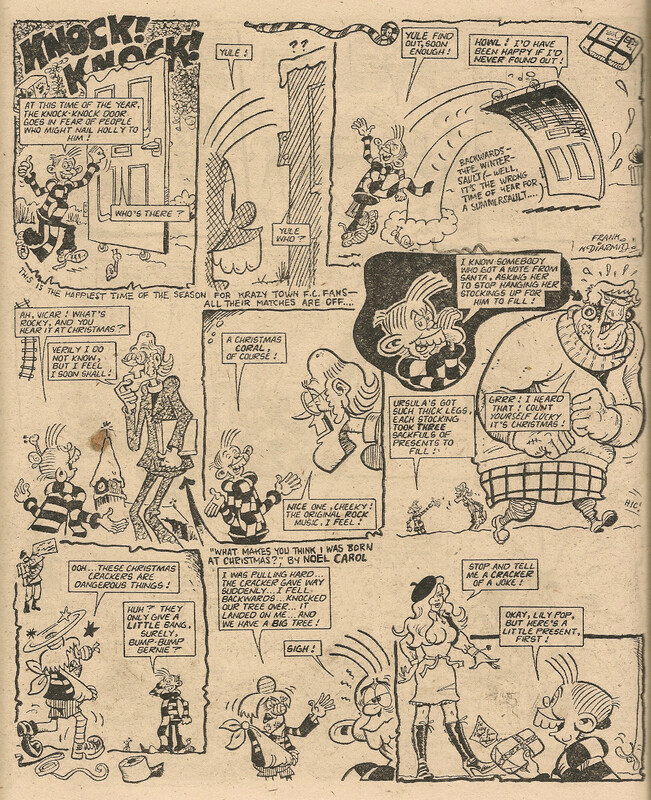 Uncle Hamish, who did become a regular participant in Cheeky's Week, made his debut in the following issue. See also Great Uncle Daniel. 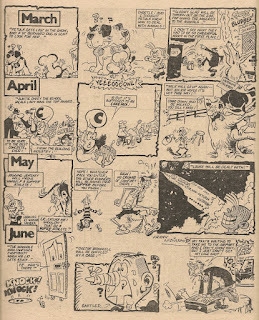 By the time of the next raid involving one of our ex-Cheeky Weekly chums, Mustapha Million's run of reprints had ceased, and new adventures of the middle-eastern moneybags were being drawn by Barry Glennard. 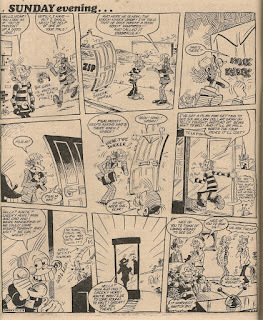 But can you spot the intruder (or maybe there's more than one) in this story? Scroll down, where all will be revealed. 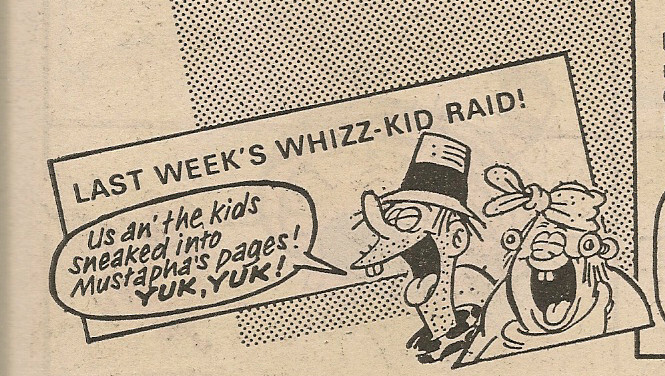 Yes Mustapha, always entirely comfortable with his wealth, was subjected to a multi-panel raid by the Bumpkin Billionaires, who strove vainly every week to jettison their unwelcome fortune and return to 'the simple loife'. Maybe the affluent agriculturalists were hoping to stash their cash in amongst the wads of moolah sloshing around in Mustapha Mansion. 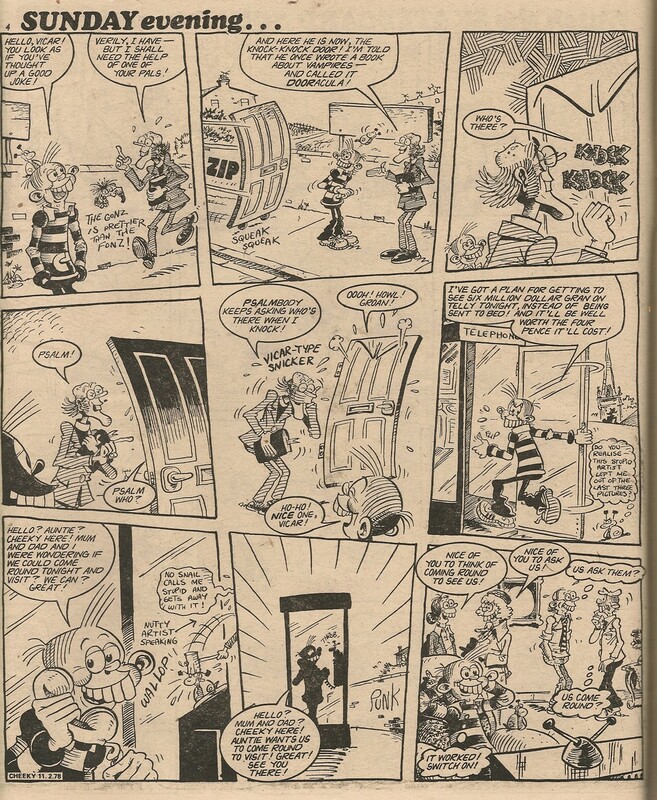 Just in case you didn't spot all of them, the raiders can be found in page 1, panel 6 and page 2, panels 3 and 6. 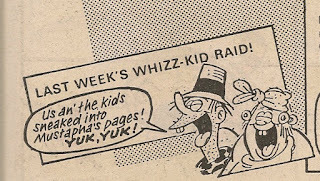 This is the first time that the Bumpkins en masse have staged a raid on our plucky pals - Pa raided Cheeky (as part of The Krazy Gang) in the 13 July 1985 issue. By this stage the Cheeky survivors had suffered 17 raids but had perpetrated 9. More raiding fun soon!